I don’t have to plant everything in the garden just yet, as I’m waiting a bit this year in an attempt to time the narrow window between ‘not ready for harvest’ and ‘bolting out of control’ so I’m actually around to harvest something. Nonetheless I’ve been digging the garden as fast as I can: my parents are coming this Easter and my mum, who is a keen gardner, will want to know how I’m doing. It would be preferable if the garden is not a bramble strewn wasteland when this happens. 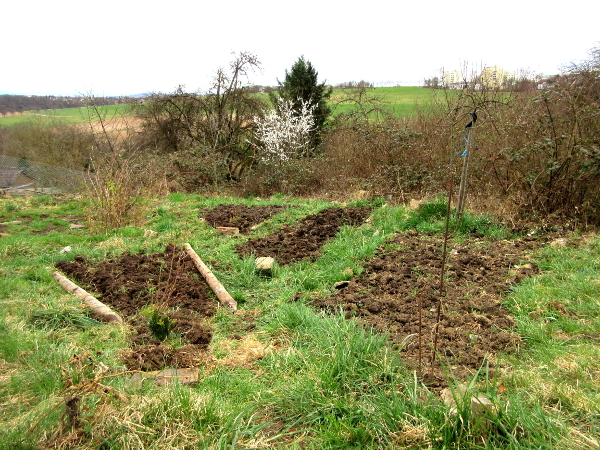 Apart from digging out the beds, I also cleared the grass off the parking space at the top of the hill (top tip: don’t leave the remains of the pile of potting compost and cow poo out on paving over winter) and filled the pots for our apartment from the compost bin. I was feeling rather virtuous today when I arrived to find that the warm weather has set the grass off again and the paths are starting to look decidedly shaggy. At least there’s a visible difference between ‘paths’ and ‘vegetable bed’. For the next week, any way.